Can I still sign up for the experiment? As previously mentioned, the yeasts will be sent out on Monday, the 26th of August. Please read the first update post what has to be done after you received the yeasts. That’s it from me already. I hope that everyone can revive the yeasts without problem and gets some nice beers out of them. Over and out! Eureka and welcome to a new science post. I would like to discuss the results from a paper about rehydrating yeasts and viability staining. 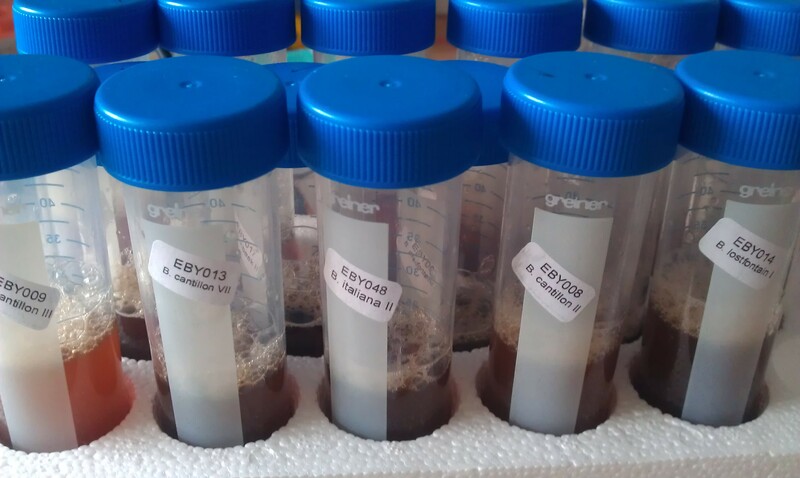 Since dry yeasts are widely used in the homebrewing scene and even on industrial scale, lots of discussions are about the effects of rehydrating the dry yeasts before use. Some rehydrate the active dry yeast (ADY) in some water and others just sprinkle the yeast in the beer. Some prefer to use warm water and others prefer colder temperatures. During the drying process, the water flows out of the yeast cells rather rapidly and leads to a collapse of the cytoskeleton (Rodriguez-Porrata et al (2008)). During the first minutes of the rehydration process, the cell’s membrane are not functionally active yet and lead to membrane leakage. In this process, molecules from within the cell flow out of the cell. During the rehydration process, the cellular membranes get repaired and thus stop the membrane leaking. If the cells cannot stop the leakage, it is going go die. Jenkins et al studied the effects of rehydration conditions on yeast viability and came to some remarkable results. The authors studied three different yeast strains (LAL1 a lager strain, LAL2 Nottingham strain and LAL4 a Munich strain), rehydrated the cells at different temperatures and for a different amount of time. 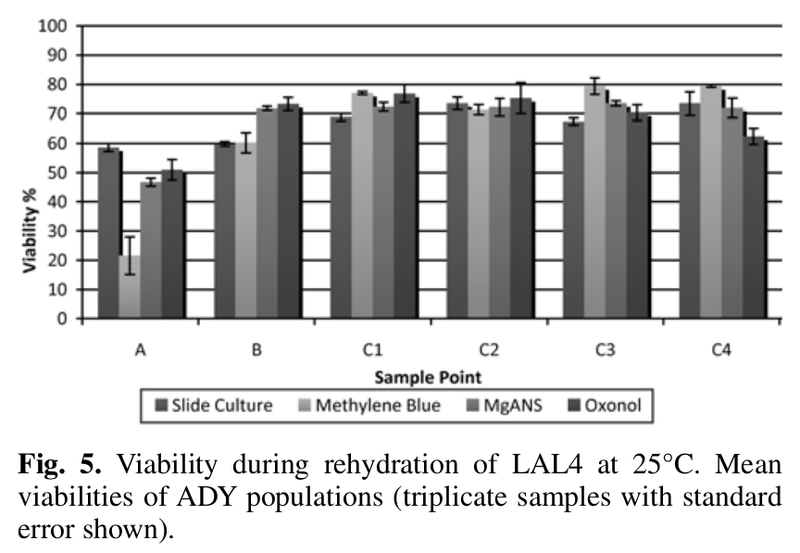 In addition, they measured the viabilities at certain time points during the rehydration process using four different techniques: Slide cultures, methylene blue, MgANS (8-anilino-1-naphthalene-sulfonic acid hemi-magnesium salt hydrate) and Oxonol staining. 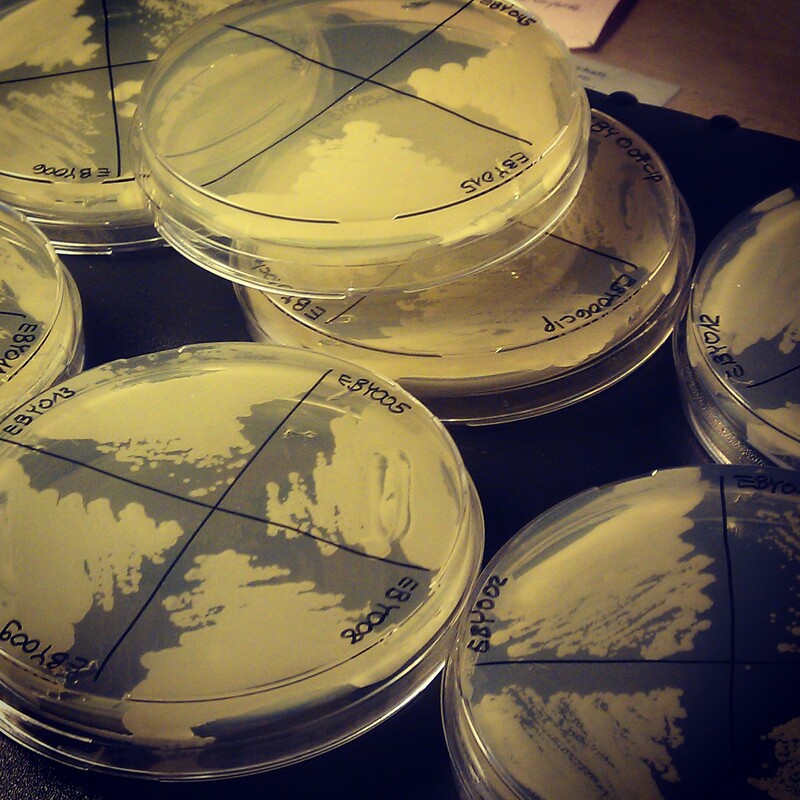 For the slide cultures, a small volume of yeast suspension was added to a small amount of agar on a slide and the arising microcolonies from the yeast cells within the agar were counted after 18 h. Thus a staining independent method to asses viability. 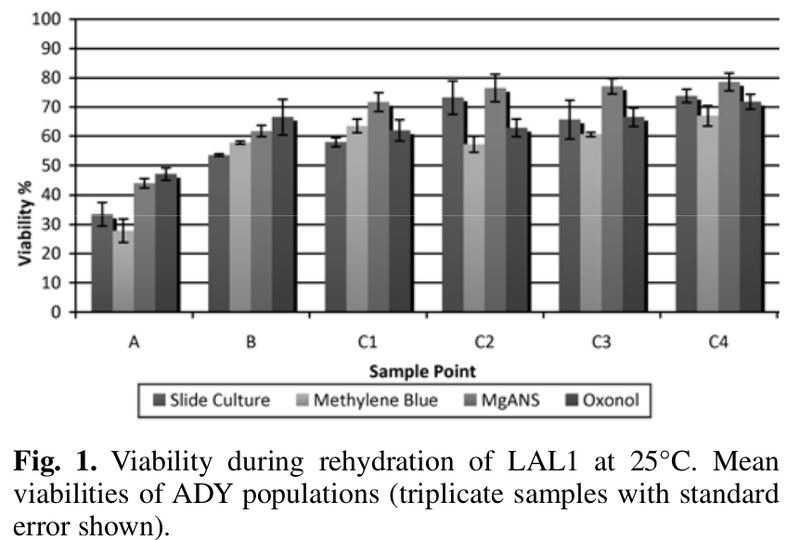 For this test, Jenkins et al used 1 g of ADY and added 10 times the weight of water (water temperatures 25°C and 30°C). Time point A was taken immediately after adding the ADY to the water. Time point B was taken after leaving the ADY rehydrate for 15 min. The yeast-water mixture was then mixed and samples were taken after additional 15 min each (time points C1 to C4). Lets look what they found out. In case of the Lager strain, the viabilities at the different time points are shown in Fig 1. I would like to leave the different temperatures aside since its effect is strain dependent and not important for my main message here. What they could observe is a lower viability at time point A compared to the other time points. This effect seems to be independent of the water temperature (not shown). Further on to notice are the different viability values one obtained using the four techniques. For the Lager strain, measuring the viability using methylene blue lead to lower values compared to the other two staining techniques. The lower viabilities at time point A could also be observed for the Nottingham (Fig 2) and the Munich yeast (Fig 3). Again, the lower viabilities seem not to depend on the water temperature of the water used for the rehydration process (not shown). Putting this observations together. 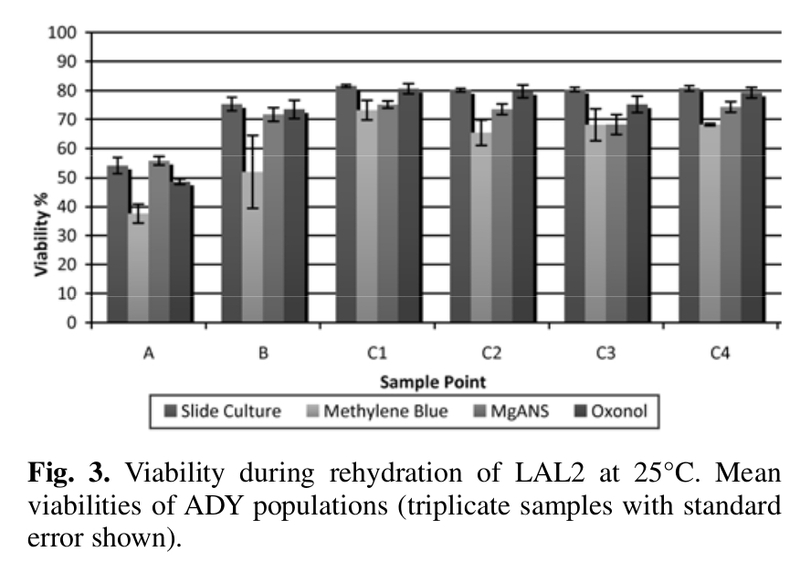 Measuring the yeast viability using staining methods such as methylene blue within the first minutes of rehydration seems to lead to significant lower values compared to values obtained from later time points. What is the reason for this you may ask? This is where it gets interesting. The first question one has to address is how yeast viabilities can increase in the first place (as observed in the figures from time point A to B and C1 in case of the staining). 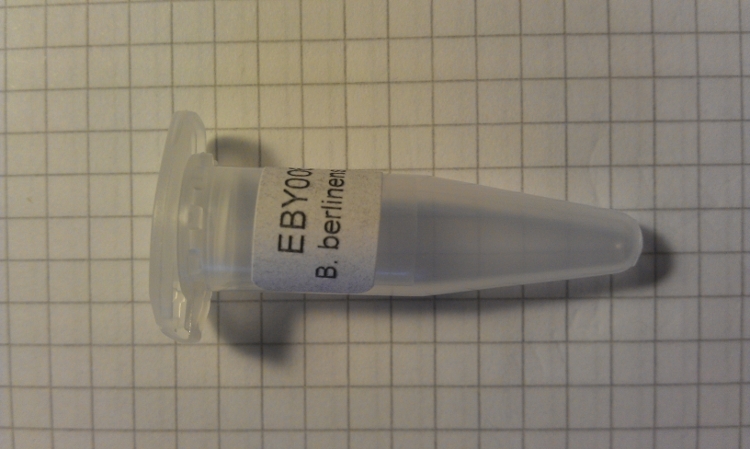 Please note that the viability measured with slide cultures in case of the Munich strain are highly similar to later time points (Fig 3). Viability, in a biological sense, can only increase by the formation of new, viable cells. One other way would be for dead yeasts to get alive again which is not very likely in my opinion (though I don’t have any proof for my statement). Due to the chosen time points, it is very unlikely for the yeasts to undergo divisions and thus increasing the viabilities again from time point A to B and C1. There has to be a different effect. The answer to the question lies within the methods. As previously mentioned, dried yeasts don’t have active membranes. During the rehydration process, the membranes get repaired again (Rodriguez-Porrata et al). Since most of the viability stainings, such as methylene blue rely on active membranes (the dye should only be taken up by dead cells with inactive membranes), dry yeasts behave much like dead cells within the first time points and thus leading to lower viability values. With time, the membranes get active again, and the dye is probably exported from the cells and thus increasing the viability. This is a very nice example of a method’s limitations. However, there seems to be an effect in the slide culture method as well. This might be due to osmotic pressure issues when the dry yeasts get in contact with a highly osmotic agar which enhances the leaking of the cells. Assessing viability measurements using methylene blue on dry yeasts is a valid method but has to be done with caution. Especially if one wants to assess whether dry yeasts have a higher viability if added to water first or pitched to wort directly. Consider the right time points for such experiments. I hope this was interesting to read and might give you a better insight into viability stains and its limitations. I would like to give you further information about the experiment today and cover some other questions I got asked so far. You signed up but would like to test more/less strains? I got the yeasts, what’s next to do? I would advise you to prepare small starters (200 mL at max) some days after the 26th of August to be prepared for the yeasts. For a 200 mL starter, add 20 g of dry malt extract to 200 mL of water and sterilize it using a pressure cooker if possible. Mason jars could be well suited for the starters. Any smaller volumes works as well. Just don’t go beyond a starter volume of 10 mL. What about the evaluation process?